Aditi Laser Integrator was formed in the year 2010 to manufacture and distribute indigenous manufactured as well as International state of the art products to the jewellery manufacturing sector in India. The motive of the founder members behind incorporation of the company is to manufacture laser machines with innovative ways that can appeal customers for both the designs and usage capabilities. Aditi Laser Integrator launched PORTAMARK - first portable laser marking machine weighing around 16 Kgs - true portability, in early 2011. And then continued working on different designs and concepts to support the market. Aditi Laser Integrator is having a team of laser experts with experience of more than 25 years in manufacturing of the machines. The team is dedicated to deliver out of the box concepts and performance. Aditi Laseralways welcomes projects for tailor made machines for application like marking / cutting and engraving on metals and non metals. The Team likes to work on the challenges given and yearns to prove their mettle time and again. 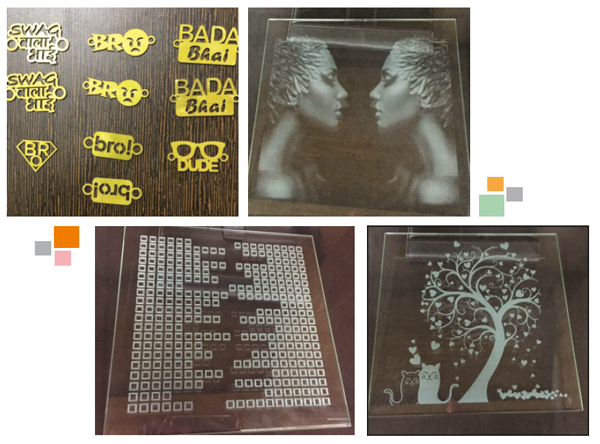 Aditi Laser Tech provides laser cutting , engraving and marking service on all materials. They currently use a wide range of machines including fiber laser , co2 laser and also end pump diode lasers . The machines range from 30 Watts to 400 watts. This wide range of machines enables the Aditi team to mark on variety of materials with optimum results. The company also offers CNC Router machine for MDF cutting and engraving. Aditi laser group is well known in the Mumbai market and in many other regions in India for the services it offers to numerous customers in the field of laser marking /engraving / cutting and supply of the machines. Aditi laser group, Mumbai is working closely with the Jewellery industry for applications of marking and cutting. Group is always trying to remain ahead of its competitors in bringing in new and innovative technology evolving around lasers. Aditi laser group is the leader in providing the portable marking laser machines for very high quality of marking. Its machines are working successfully with many of the industry leading manufacturers / exporters and hall marking centers. Aditi laser group has always focussed on giving technology which is value for money and has always provided best of the post sales support to its customers all around India. Aditi laser group has its own service job shop setup in Mumbai. The Group provides full support to all of its customer to achieve more and add value to their products. Being the trusted name in the industry for more than a decade, always gives confidence to customer.